Installing a patch is a simple matter as it only requires the end user to answer a question if the application directly uses database tables. That question is whether or not to setup the database. For all but one of the users of the database the checkbox should be left unchecked - the default. The patch's relationship to the primary application version and the primary's current configuration is all that is necessary. 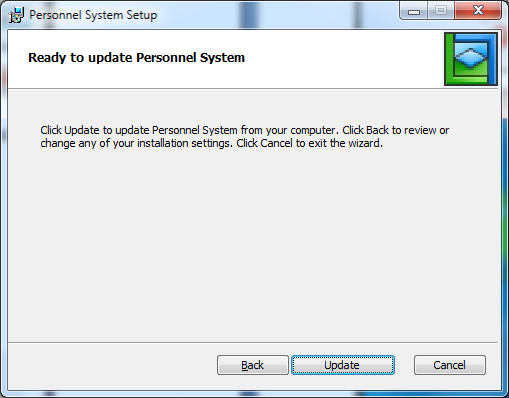 Once a patch has been started, following the same steps as described for an application installation, the end user simply has to confirm that they wish to proceed. Patches may deliver a wide variety of changes to an Application, generally this will involve updating '.dll' and '.exe' files and modifying shortcuts and so on. A patch is capable of including changes to a database, for example, table definition modifications. Uninstalling database changes require careful consideration as the default behavior is to restore the database table back to its previous state but keep all the data in its current state, apart from the dropping of new columns that were added by the patch. Some complex database changes may allow, say, larger numbers to be in a column, so when you restore the previous column with the smaller number limits with the larger number the restore will fail. Needless to say, before installing a Patch that contains database changes a backup should be made and also if the Patch needs to be uninstalled a backup should be made before doing so. Press Next to proceed through the install wizard.